TUNGKU: The world's largest solar hybrid station in Kampung Lok Buani, Tanjung Labian is proof of the Barisan Nasional's government's concern for the community in rural areas. 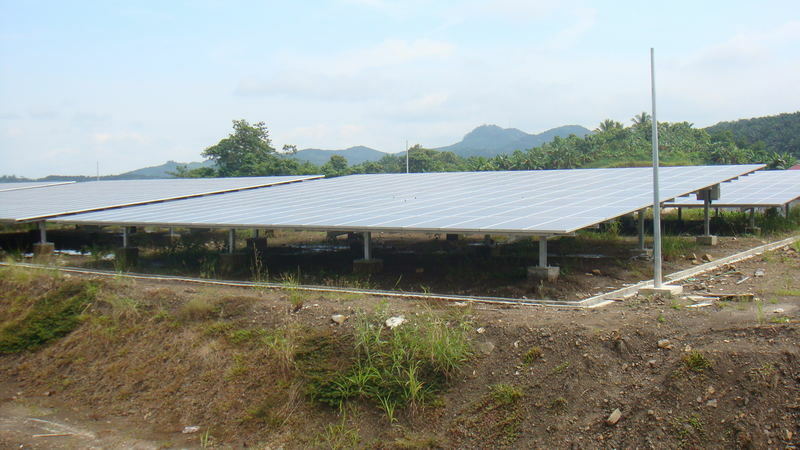 The solar station on a 10-acre plot will benefit villagers in seven villages in the Tanjung Labian zone, namely Kampung Tanjung Batu, Kampung Tanjung Labian, Kampung Tanagian, Kampung Bahagia, Kampung Sungai Bilis, Kampung Lok Sembuang and Kampung Lok Buani. Tanjung Labian has great potential to be developed as it is rich in natural sea resources. It's natural beauty is also suitable to be developed into a tourist attraction. Minister of Rural and Regional Development, Datuk Seri Mohd Shafie Apdal in a press conference after launching the RM132 million project said it is aimed at providing comfort to the community. "This project will not only provide comfort to the villagers but also facilitate the villagers in conducting their activities, unlike before where the villagers have to rely on generators. "This project will also able to help increase their income, where they could utilise the power supply for business or otherwise," he said. According to Shafie, the project is divided into two phases where the first phase costing RM92 million have been completed, while the second phase involving RM42 million was still under construction and expected to be completed by the end of this year. He said the second phase of the project was delayed due to the intrusion incident which the ministry have to increase the allocation as the pole and structure of the project were damaged during the incident. "We are aware that Tanjung Labian was far behind in terms of development and the absence of electric supply also affects the development of the area. Shafie said this is proof that the BN government always put the people first, no matter whether they are in the town or in rural areas. Meanwhile, Shafie said 108 houses will be built by his ministry through Felcra and Giatmara for the villagers who have lost their houses in the intrusion . He said 71 of the 108 houses have been completed and each house cost RM12,000 while the rest will be completed by the end of May. Commenting on the 13th General Election, Shafie said he regretted the allegations by the opposition that phantom voters have been brought to Peninsular Malaysia from Sabah. "They have been working there and do not change their addressÉthey have registered their name in the country, so they have to return there to vote and this issue should not be raised by the opposition" he added. Meanwhile, one of the villagers, Mohd Bismi Ahbar, 38, said their life have been improved with the setting up of the solar hybrid station. He said his eight-year-old daughter now can study in a more comfortable environment. Also present was the candidate of Silam Parliamentary, Datuk Datu Nasrun Datu Mansur.